Black Friday & Cyber Monday in Brazil. In Brazil, Black Friday and Cyber Monday are a very recent arrival. Black Friday has officially been celebrated by Brazilian retailers since 2009, but it was only very recently that the media and the general public began to take a very serious interest. 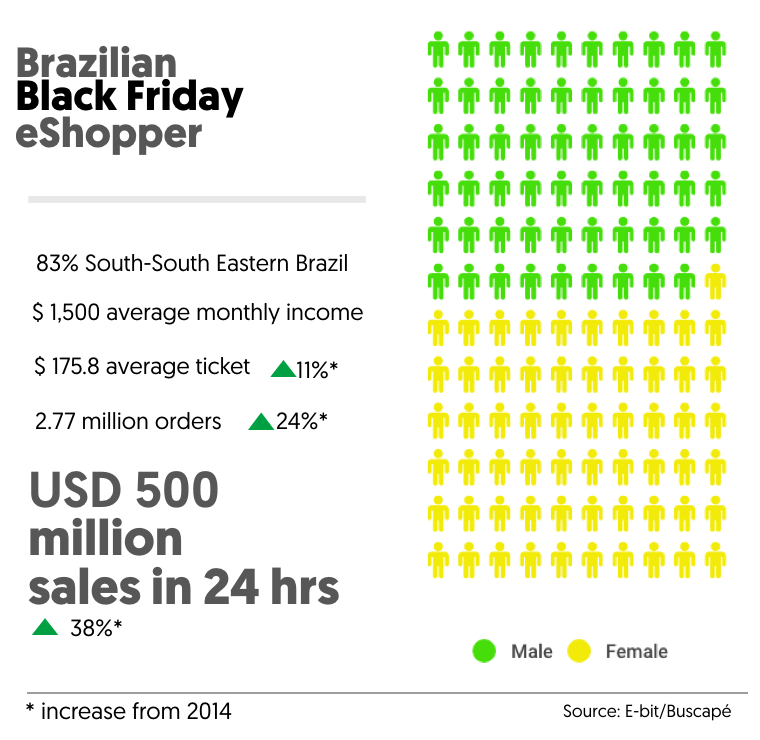 Brazilian large retailers pushed hard to establish a Black Friday and replicate the successful American tradition. Finally, all the most iconic Brazilian department stores embraced the day and offered aggressive discounts to customers on the day after Thanksgiving, which is not celebrated in Brazil. The splurging continued last year. Brazilians are estimated to have spent R$ 1.6 bn shopping online on Black Friday 2015 – Surpassing for the second time the R$ 1bn sales in one single day, an increase of 38% from the same day in 2014 according to an estimate published by Brazilian e-commerce research group E-bit/Buscapé. That same report shows that more than 2.7 million orders were processed on the day of Black Friday, an equivalent to 24% increase from last year’s edition. The increase in online expenditure clearly shows that this date is likely to continue to be a permanent fixture in the online retail calendar in Brazil, and 2016 is expected to reach the R$ 2 bn mark. In total, over 1,64 million eShoppers made at least one purchase in the 24 hours of Black Friday. Cyber Monday is already following the the steps of Black Friday success. Since its first edition in 2012, it has grown notably, attaining R$ 294M in sales, representing a 56% growth from last year. Altogether, 679 thousand orders were processed, a 24% increase from 2014. 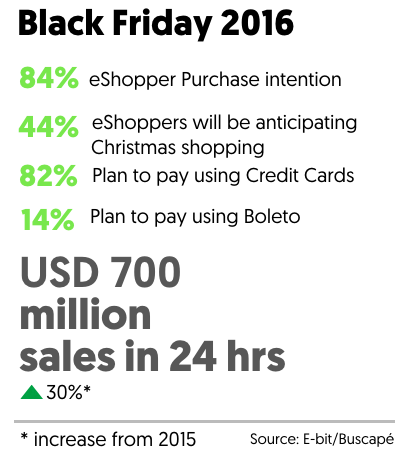 The sales from Black Friday, the weekend up until Cyber Monday totaled R$ 3.02 bn. Some eStores have started offering moderate discounts on what has been dubbed “gray Thursday” a local adaptation since Brazilians do not celebrate Thanksgiving. Black Friday Brazil 2016 – A chance to boost your sales in Brazil. In 2016, Black Friday will happen November 26, if you did not participate in last year’s edition, this year is promising. Remember Brazilians have embraced the date and different researches show that at least 44% of eshoppers will use this opportunity to anticipate Christmas shopping. With EBANX you can offer your black friday shoppers the most relevant payment methods in Brazil and across Latin America. Get a free consultation with one of our Payments Experts to find out more about your payment strategy in Latin America.